Encaustic paint is truly different from every other kind of paint. It looks different, smells different, feels and behaves differently. 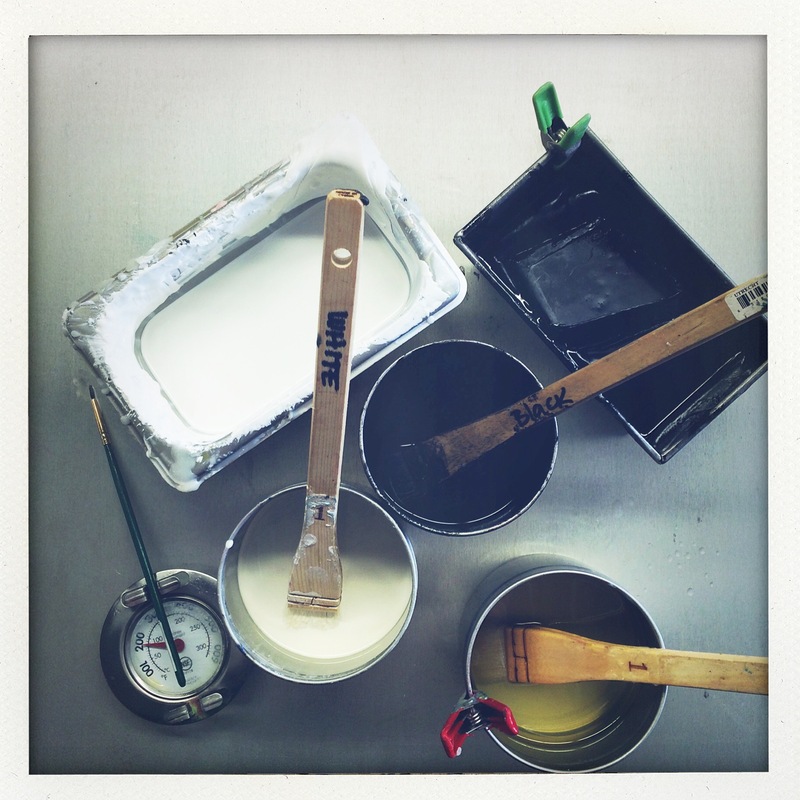 All encaustic paint comes in solid form. Heat must be applied for the wax to become liquid. Encaustic paint does not dry, it hardens. Quickly. For this reason, an encaustic artist must work with purpose and speed. This can be exhilarating, or exasperating, depending on your method of working, and your goals. Or maybe just your mood that day! You can see my paints above. I’ve ordered them from R&F Paints, but a quick internet search will turn up several other suppliers. I like the quality of these paints, and have relied on them for years now. The little round cake off to the right is a color I mixed to have on hand- you can custom mix colors in small muffin tins, or in recycled small cans. If you put the muffin tin in the freezer, the paint will pop out, and if you mix it in a can, you can just leave it there and put it on and off your pallet as you need it. I find that the solid paints are very concentrated, and I usually dilute the color with clear beeswax medium. 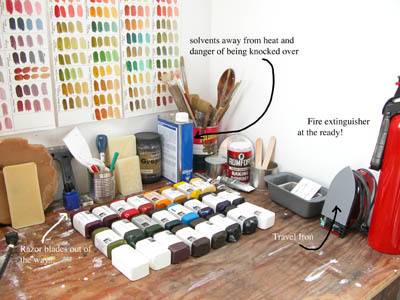 To use and mix the paints, the block of paint is touched directly to a hot pallet (at aprox. 200-220 degrees), and it instantly melts into molten paint. A little goes a long way. A natural bristle brush is used to apply the paint, and it hardens quickly on the surface of the painting. How much working time you have between the moment your brush leaves the pallet and the hardening of the paint and brush depends on how hot your pallet is, how warm the surface of your painting is, and how warm the room you are working in is kept. I have a small space heater in my studio for cold days or nights- mainly because it extends that brief working time. Just like other types of paint, different colors of paint behave differently- some are more transparent than others (manganese violet, cerulean blue, zinc white), some tend to separate if they sit on the hot pallet (cerulean blue, indigo, zinc). Some are more ferocious than others (alizarin crimson, phthalo green), and tend to dominate when mixing with other colors. The earth colors can be ever so slightly grainy sometimes. R&F offers a color chart for ordering their paints that are actually made with little squares of paint- and if you are thinking of ordering online, it is a great resource to have, as it gives you some clues as to the nature of each color. Some artists make their own paint, using beeswax medium and powdered pigment. I’ve never tried this, and if you decide that this is the way you want to go, I’d do some research on handling powdered pigments safely. Sinopia Pigments, Earth Pigments, and Daniel Smith are all resources for powdered pigments. I have mixed my own colors using beeswax medium and a dab of oil paint. In this case, you want the mixture to be mainly beeswax. If you use too much oil in the mix it will neither harden, nor dry properly. Not good. So just a little pigment to a greater amount of wax. This is really handy if you already own oils, and have a limited color range in the pre-mixed wax blocks. It’s easy to occasionally mix a little of a custom color this way. Powdered graphite can also be mixed with wax medium to create a warm grey with some luster, and you’ll feel just like Jasper Johns. First, I made a list of my colors. Then I created grids on printmaking paper (other thick, absorbent paper will work too). I wrote the first color at the top of the page, and painted the color next to it. This was my base color. Then, I labeled each of the boxes with the remaining colors. I mixed each color with the main color, and some clear beeswax. I added a bit of white for each stroke, increasing the tint a little each time. I designed it this way because I often work with tints. For the next chart, I’ll delete Alizarin Crimson off the list, so the charts get a little smaller each time. When I’m done, I’ll have a sample of how every color interacts with every other color in my pallet. Depending on your techniques, color range, and inclinations, you could use this idea in a variety of ways. You could make charts exploring shades, or transparency. You could design a color wheel instead of grids like these. The point is that a systematic exploration is a great way to get to know how colors in this medium (or any medium) behave. This entry was posted in beeswax, color, encaustic, encaustic technique, painting, studio and tagged art, art technique, encaustic, encaustic color, encaustic technique, painting on January 14, 2009 by LisaK. One of the outstanding properties of encaustic is it’s translucency, which makes it a great medium for collage. Collage can be used with encaustic to provide the main focus of a painting, or it can be used in under layers of the painting to give a sense of depth that is hard to accomplish in any other medium. It can be combined with many other techniques without any trouble. 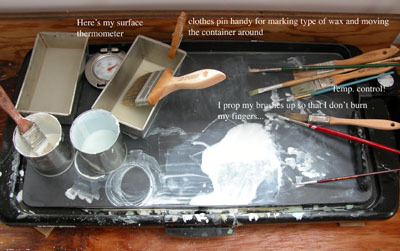 I’ll also be talking here about “enclosures”, or adding small objects to your paintings. This can be a bit trickier, and I’ll explain why and give some tips for successful enclosures. The first thing to understand about encaustic collage is that your collage materials must be compatible with your beeswax. By this, I mean that they must be an absorbent material, especially if they are large. They must also be compatible with heat, since you will need to apply heat for fusing your layers. I also don’t recommend anything perishable, unstable, or moist. Materials must be dry and clean. Consider the stability of any inks used on papers- newspapers, ink jet prints, and other printed papers may fade rapidly, even in low light, over time. Most printed paper will fade to some degree, but some will fade much more dramatically than others. Basically, get to know your materials, and how they relate to the nature of your work. If in doubt, do a light test by putting the papers in sunlight for a few days and seeing what happens. Here is a little selection of things I had lying around my studio. Paper, tissue, fabric, photos printed on paper, ribbon, lace, all work. Other materials I’ve seen people use are clean feathers (especially small, wispy ones), plant materials such as rose petals, string, wallpaper, and wood. Anything relatively flat, and absorbent. Be careful with coated papers, and any paper that is rigid and may react to the heat by curling or buckling. Again, there is no real substitute for getting in there, trying some things out, and getting to know your materials. One of the great things about encaustic is it’s forgiving nature. If something doesn’t work out, you can always take it out, re-fuse, and keep on going with the piece. Some of my favorite pieces have been happy accidents. When you know what you want where, just place it on your wax. I use a wooden spoon to carefully burnish the paper onto the wax. You don’t need to press very hard to do this; the wax is generally receptive, unless it is very cold in your studio. You want to press out any air bubbles, making sure that your paper or other collage material has good contact. Then, lay down a layer or two of beeswax over the collage, or over the whole panel if you like, and fuse. I like to use cheap 3-inch natural bristle brushes from the hardware store to lay down even, thin layers. At first the wax will appear milky, as in the photo above, but as it cools, it will become clearer. You can add layers repeatedly, as long as you remember to fuse between layers. Depending on what kind of surface you are aiming for, you can fuse lightly or heavily. An “enclosure” is when you add an object to your painting. This is trickier, and I suspect not as archival as adding thin layers of absorbent materials, but I’ve seen it used to great effect. One painting I remember involved perhaps a hundred white buttons, and rose petals. The idea with enclosures is to use small objects that can be contained, or enclosed by the wax, or objects with perforations, such as doilies or produce netting, which will still allow for a matrix of wax on all sides, so that the integrity of the wax is maintained. If the ratio of objects to wax is too heavy or if the piece is not properly fused, it could crack or break off. On the other hand, it is worth experimenting with, and I’ve seen some really nice work with objects incorporated into wax. SO- go on, fire up that hot plate, and get to work! This entry was posted in beeswax, encaustic technique, painting and tagged art, beeswax, collage, encaustic, painting, technique on December 29, 2008 by LisaK. I always have a source of fresh air in my studio. I don’t heat my wax above 220 degrees. I always use a candy or a surface (depending on the situation) thermometer to check this. This is mostly because above this temperature, the wax starts creating fumes that really rip my throat up. After years of turpentine exposure, that’s the last thing I need. If you over heat your wax, you do risk flames. I’ve never used a torch to fuse. 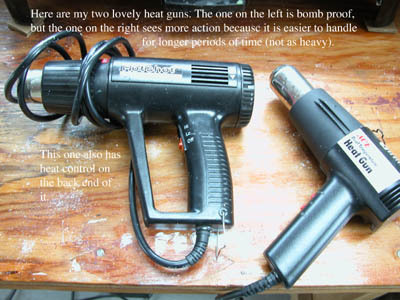 I’ve always used a heat gun. Sometimes a travel iron. A torch may be in my future, but I’ll wait until I can learn to use it with someone who has some experience! I melt small amounts of wax at one time. Even for large pieces, I’ve learned not to heat more than I need. This is for both safety, to reduce fumes, and to preserve the integrity of the wax, which starts to shift color (to amber) if heated too long or too hot. Not good for someone like me who works with a lot of transparency. I keep a fire extinguisher next to my work table. I’d also like to install a fan system in my studio for sucking fumes away as they rise from my hot palette. Soon. This is just a pancake griddle from Target. I have a fancier, anodized aluminum one, too, but I’ve been using this one lately. It’s bigger. When I start working with color more, I’ll probably get the other one fired up, too. So what can we paint on? Let’s talk about supports. The cardinal rule for encaustic supports is that your surface MUST be absorbent, and ,ideally, rigid. The reputation of the structural integrity of your work rests on this (literally). If your base layer of wax cannot be fused into your support surface, you’re going to run into problems. Not right away, but eventually you’ll be faced with a painting flaking, chipping, or sliding off the support. It is possible for the entire painting to just pop right off the support. A flexible support (such as canvas or paper) is problematic because it will flex, and your wax will not- or not much, anyway, depending on it’s thickness. Not good for you, not good for your collectors. So, with this in mind, what are the options? I’ve probably missed some, but you get the idea. That first layer of wax has to be able to sink right into the surface. I’ve mostly used cradled untempered masonite panels for my own work, with printmaking paper or canson type paper adhered to the surface. I’ve also tried claybord, painting directly onto wood doors, and plywood panels with paper. Lately, I’ve been using a product from Golden called an absorbent ground. I was skeptical about it, but it seems to be working fine. R&F is marketing a similar product under their own name- not sure if golden is making it for them or what. Since this was a new support surface for me, I tested it. I covered a wood surface with several layers of the product, then two layers of beeswax. I fused the wax into the surface, and allowed it to cool. Then I abused it. I dropped it on the floor. I whacked it, and carved into it, and it held up. You can test surfaces you are unsure about this way. The wax will show the abuse, but it shouldn’t buckle up off the support, and the wax should not chip or separate in large sheets. I’ve seen artist’s use flexible supports for their work, and it can be beautiful. No hours spent building and preparing supports. But the resulting work is fragile, and must be handled very carefully. Shipping could be a bear. That’s the hitch. I am thinking of doing a series of very small works on paper, and mounting them on board for support and display when I am done. We’ll see how it goes. Just be aware that the thicker the beeswax, the less flexible your art will be, and handle and protect it accordingly. Another consideration for supports is weight. Wax is heavy. Putting wax on a heavy support makes it difficult to hang, ship, and handle. So keep that in mind when considering your materials and size. When I am working large, I prefer to use hollow core doors that I cut to the size I want, and then finish my edges with pine stripping. In the future, I’d like to try some of the panels manufactured by Rodney Thompson. That’s all for now, I hope this has been helpful. If I’ve left anything out here, please feel free to add it in the comments. This entry was posted in encaustic technique, painting, studio and tagged art, encaustic, safety, supports, technique on August 18, 2008 by LisaK.